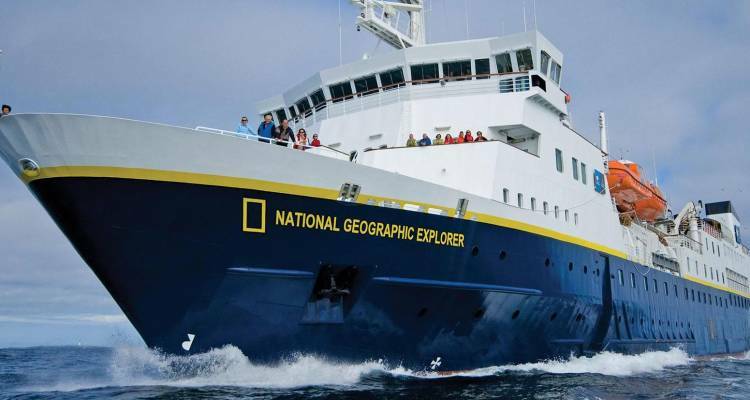 The National Geographic Explorer is a polar expedition vessel that holds 148 guests in 81 outside cabins. Her design and equipment is the result of almost 200 years of collective expedition experience. She is equipped with an ice-strengthened hull and advanced navigation equipment for polar expeditions and is perfectly maneuverable for polar passages while providing exceptional comfort. She carries kayaks and a fleet of Zodiac landing crafts. And an undersea specialist operates a remotely operated vehicle (ROV) and sophisticated video equipment, extending access to the underwater world. Meals are served in the ship's elegant dining room and the adjacent, more intimate Bistro Bar. Seating is open, allowing you to choose where to dine, and table sizes range from 2 to 12. The style is relaxed and casual—there’s never a need to dress up, and there will be opportunities to chat with the onboard naturalists and guest speakers over your meal. Each evening, a ship’s officer, National Geographic staff or a naturalist hosts small tables in the chart room. All food prepared aboard National Geographic Explorer is sourced locally whenever possible from sustainable providers, with special attention to all seafood being sustainably caught or raised.